The hygrostat detects the humidity and the room temperature using internal sensors and calculates the optimum air humidity for the respective measured temperature. For example, if the humidity exceeds the value set on the rotary knob, the hygrostat switches on a fan to dehumidify the room. A fixed setpoint control that can be activated by the installer (e.g. in public buildings) prevents unauthorised changing of the humidity setpoint value: In this case, 60% relative humidity is permanently set, regardless of the position of the rotary knob on the front of the device. 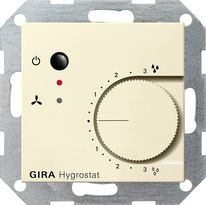 The hygrostat monitors the switch-on time to prevent continuous operation of the fan in case of a generally high ambient humidity (e.g. when thunderstorms are possible). If the humidity does not drop below the set value after one hour, ventilation is interrupted for four hours. This interruption is indicted by an LED and can be manually affected with a button.